We often go through difficult times in our lives and we end up asking, “Why Me?” We may ask, “What did I do to deserve this?” What if our circumstance is not about us at all? What if there is some bigger thing happening? When the disciples asked Jesus what the blind man did to deserve being born blind or what his parents did Jesus blew their minds. In Jewish culture in the first century, being born with an affliction of this nature meant that someone’s sin was the cause. Jesus told the disciples that nor the man’s nor his parents’ sin caused this blindness. Jesus explained that this malady was so the works of God might be displayed. This blind man did not see Jesus, but Jesus saw him. This man was born in darkness and lived there his whole life. All this man knew was his deficiency. The only thing he could see was his inability to see. How often are we so consumed by our short-comings that we completely lack any and all vision? So much of our circumstance may, in fact, exist for the benefit of someone else. I was speaking to someone recently who lost a loved one to suicide. This young girl was incredibly talented and a great artist. She had bipolar disorder and it was rather profound. One of the ways that she dealt with this was to blog about it and work at her college’s mental health support group. She helped counsel other people who struggled with mental health issues. Of course, no one wants to lose someone to suicide, but when trying to help my coworker make sense of it, I realized that had this girl never had to live through profound bipolar disorder, she may have never been able to help another through the same thing. I wonder how many people were helped by this girl. 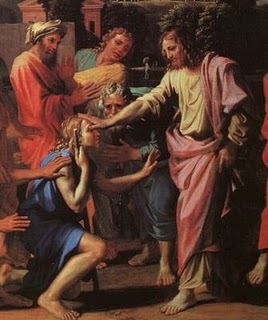 When Jesus healed the man born blind at the Pool of Siloam, He was showing the power of the Father. Jesus came to reflect His Father’s glory and show the world His love. Perhaps the only reason that this man was born blind was so that one day, a traveling teacher who claimed to be the Son of God could show people the Father. Don’t be so self-consumed to think that it’s all about you. Chances are, it probably isn’t. Paul said it in his letter to the Romans, “We know that all things work together for the good of those who love Him; who have been called according to His purpose.” This does NOT say that God works all good things for those who love Him. He works all things together for the good of those who love Him. Ask God today for some perspective and maybe you can gain vision, you can cease to live in blindness. This entry was posted in Uncategorized and tagged blindness, circumstance, healing, vision on April 6, 2014 by jrobotromine. Even if the circumstances are difficult they do not diminish the goodness of God. Good perspective Jason.